Mouse Gestures let you speed up navigation and perform useful actions with quick movements of the mouse. 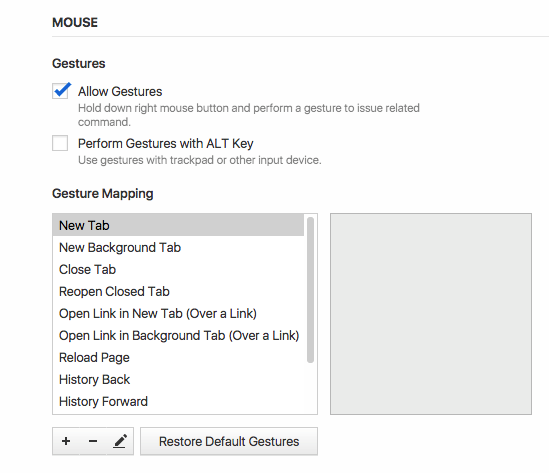 You can edit existing gestures and add your own to match your browsing style. Read on to find out more. Go to Settings > Mouse. Check the Allow Gestures box. Click and hold the right mouse button (or click and hold the ALT key). Move the pointer to perform an action. You can also perform gestures using other input devices, such as trackpads or touchpads. To enable gestures for other devices, check the box for Perform Gestures with ALT Key. To view default gestures, to Settings > Mouse > Gesture Mapping. Go to Settings > Mouse > Gesture Mapping. Pick a command from the drop-down menu. Draw a new gesture in the highlighted area and click Save Gesture. Pick a gesture you want to edit. Click on the Edit Gesture button. Draw a new gesture and click Save Gesture. Go to Settings > Mouse > Gesture Sensitivity. Move the slider to set a minimum stroke length to be recognized as a gesture. Rocker Gestures let you quickly go back and forward in history. Go to Settings > Mouse > Rocker Gestures. Check Allow Rocker Gestures box to enable this feature. To go back in history, click the right mouse button, followed by the left mouse button. To do forward in history, click the left mouse button, follower by the right mouse button.